We greatly value the feedback we receive from our customers and would be grateful if you could take a few minutes to let us have your thoughts on the building and the customer service you received. Arrived bang on time. Checked the access. Built the shed in 50 minutes flat and moved on. From start to finish this has been the best customer service I have ever received. Polite; helpful; professional; efficient and effective. The cherry on the cake is the quality of the product – it is exceptional. Thank you. I just wanted to say how very pleased I am with our shed. I love the church windows, and am so glad i opted for those, likewise the paint colour, which I chose quickly and it fits in just right. Your whole service has been really efficient and professional right from my initial enquiry, and I’m so glad I chose you. Thank you so much, i would recommend you to anyone. First class service and a brilliant shed. Our shed was delivered this week and we were very pleased with the quality. The shed was delivered on the day specified and built in ‘no time.’ Thanks for the service and advice. 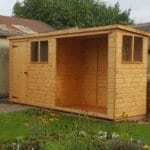 We will have no hesitation recommending Master Sheds in the future. Thanks again. We just want to thank all the team at Master Sheds for all their help with our ‘big build’! Right from the outset they have been outstanding. Turning our design into reality! It really has been a bespoke build from start to finish. Their advice & knowledge has been key to its success. 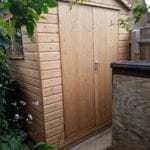 We would happily recommend Master Sheds to anyone. Thanks again for all your help. We are so pleased with the shed you made us for my husband’s mobility scooter. Excellent service. Thanks for bringing and erecting a fantastic made to measure shed today. Fitted perfectly next to my original shed in a very tight space. Very professional. Thank you guys. I just wanted to say thank you to all your staff for the great service and a wonderful workshop. It’s nice to see a private company doing so well. It’s worth the wait for the quality and service you provided. Thankyou Mastersheds for taking my design for a shed with an attached enclosed sitting area and producing a brilliant solution. 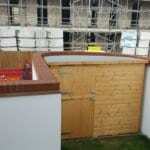 The helpful staff, quality of build and the customer service were impressive and second to none. Brilliant and thanks again. I am delighted with our new shed. The shed was totally designed to our requirements. The materials used and craftsmanshift are of the highest quality. We informed of the build every step of the way and invited to see it in the workshop before installation. The staff are professional, courteous and nothing is too much trouble. I highly recommend Master Sheds if you want amazing customer service and a high quality shed. Fantastic service from a fantastic company. From design to build, Mastersheds were excellent; they listened to what we wanted & offered good advice & suggestions. 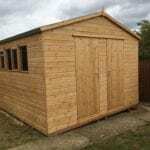 If you want a cheap shed that might last a few years – go elsewhere, if you want a quality build at a reasonable price, built to your specification & requirement that will last – then go to Mastersheds. To say we are pleased with our product is an understatement – we are thrilled! Its also comforting to know that Mastershed guarantee their work & we can go back to them if we happen to encounter any problems in the future. Cannot recommend this company highly enough. Great crew and very well lead. Thank you very much. 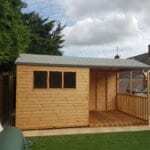 The shed looks great and is just what we wanted in the odd shaped space we had. Thanks for the great service. Thanks again and best regards. 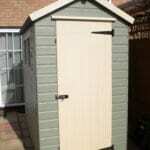 Fantastic service from Master Sheds. I had a strange L shaped requirement for our replacement shed. 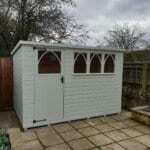 Master Sheds have provided us with a fantastic addition to our garden. The people were great, very friendly and efficient. I would 100% recommend them to anyone wanting a quality product. Excellent product. Really pleased with shed . Service was superb and very efficient. It was delivered on time and put up without any fuss. I would highly recommend master sheds. We are absolutely delighted with our mini Rolls Royce of a shed. We would recommend you to anyone who wants a quality product. Thank you. Thank you so much for our lovely new shed and studio. They have exceeded our expectations, we are over the moon! Two super sheds have been built. Professional, prompt and fantastic communication. Many thanks for the high quality service and products! Brilliant service, great product, speedy and efficient. I would thoroughly recommend to anyone, and, the boys didnt even want a biscuit with their tea!!!! Thanks the shed looks great and the guys have done a really good job. Very helpful. 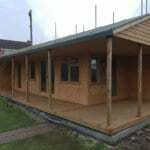 Thank you for our brilliant 12 x10 fully insulated and lined studio. It was well worth the wait. We wish we had one years ago. Put up so efficiently, every garden should have one! Beautiful summerhouse. Delivered spot on time. Extremely friendly and professional to deal with and excellent communication. Definitely recommend. We are so pleased with the shed you made us for my husband's mobility scooter. Excellent service.